WESTLAKE VILLAGE, Calif.--(BUSINESS WIRE)--Microduino Inc., an award-winning global designer, developer, manufacturer and seller of stackable electronic building blocks, related components, and in-class science, technology, engineering and mathematics (STEM) learning systems, today announced the introduction and availability of four curriculum-ready Microduino Mix Kits to facilitate STEM/STEAM instruction in a broad spectrum of academic institutions. Exclusively designed for the education market, Microduino Mix Kits increase students’ interest and proficiency in skills critical to building tomorrow’s ideas, products and workforces. Numbered 1-4, each Microduino Mix Kit includes a combination of hardware components, coding resources, and extensive instructional materials to guide students step by step through challenging in-class product development and coding projects. Each subsequent Mix Kit focuses on more sophisticated concepts so students can further their abilities to think logically and sequentially, and solve life and technology-focused problems. 1. Microduino Mix Kits grow along with a student’s understanding and imagination. They are specifically designed so children can tackle new challenges and develop new skills. Rather than focus on one project, each kit level offers 12 projects, and encourages students to design and build their own applications based on the subject matter they learn. The intent is for students to take the STEM/STEAM knowledge they have acquired, and then use it to create their own imaginative designs. 2. Each Microduino Mix Kit includes online access to a detailed, 280+ page lesson plan that is constantly updated, and has been validated by an independent, well-respected third-party to be in alignment with current STEM/STEAM curriculum standards. Microduino Mix Kits come in four levels, Mix 1-4, with each kit including 12 projects pre-coded in Scratch 3.0, electronic components, and complementary lesson plans. A cornerstone of the product’s STEM value is its focus on coding, and teaching students how to program various projects and their respective components. A code is the written sequence of commands created in specialized coding editors, such as Scratch, that tell individual electronic components how to behave. Reading and editing basic code. How to code basic behaviors. How to extend coding to two- and three-step functions. How to think in terms of organization, priorities, logic and creativity. A wider range of component actions. Sequential logic that creates interconnected dynamic behaviors, such as those in smart home environments. A prelude to artificial intelligence (AI), human logic, and how programming effectively corresponds to this ecosystem. Conceive and engineer personalized projects. Create projects using Microduino technology for science fairs, robotics clubs and many more! Prior to releasing its Mix Kit series, Microduino has successfully sold and distributed its consumer-oriented project collections, Itty Bitty City, mPuzzle, and mPie, aimed at helping children as young as five learn the principles of basic circuitry. To learn more about Microduino and its Mix Kits, please visit www.microduinoinc.com. 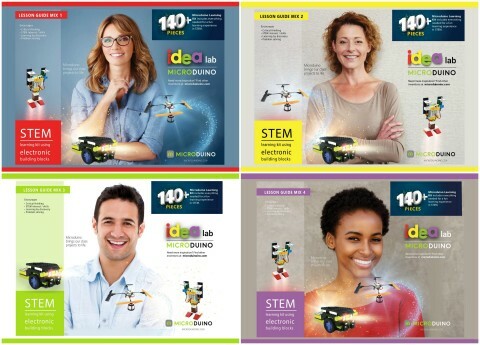 Educators interested in acquiring Microduino Mix Kits can visit http://microduinoinc.com/educators for more information, or contact the company’s sales department at sales@microduinoinc.com. Microduino, Itty Bitty City, mCookie, mPie and mPuzzle are registered trademarks of Microduino, Inc. Founded in 2012, and based in Westlake Village, Calif., Microduino is an award-winning global designer, developer, manufacturer and seller of stackable electronic building blocks, related components, and in-class science, technology, engineering and mathematics (STEM) learning systems which encourage and enhance inventors’ creativity, imagination, and ingenuity through project-based learning. With tailored STEM/STEAM offerings for individual consumers and schools, Microduino offers a broad range of modules, sensors, and project kits which improve critical thinking and problem-solving abilities, while enabling creators to bring their inspirational and pioneering concepts to life. Because of their ease of use, unique patented hardware design, and nearly unlimited applications and configurations, Microduino products have spawned a passionate and highly-innovative worldwide community of students, faculty members, makers, engineers, and electronics enthusiasts of all ages, backgrounds, and skill sets. For more information, please visit Microduinoinc.com, and follow the company on Facebook, Instagram, Twitter, and YouTube. Microduino introduces four new curriculum-ready Mix Kits to facilitate STEM/STEAM instruction in a broad spectrum of academic institutions.